For us, halfway across the world, Maryland won the championship on April Fools Day. We didn't believe it when they won. After yelling ourselves hoarse, we ate breakfast and caught a bus to Abu Dhabi, the capital, the richest emirate, and the one that overshadows the other six emirates comprising the UAE. Before oil, Abu Dhabi started as a small pearling village. The pearling market collapsed in the early twentieth century and Abu Dhabi fell into poverty. Only fifteen thousand people lived on Abu Dhabi island in 1958 when the country struck black gold. Oil brought fast prosperity. 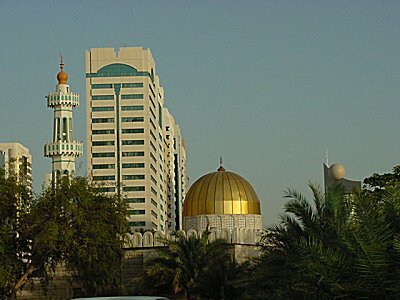 Skyscrapers replaced mud huts, Mercedes replaced camel carts, and a desert metropolis replaced the village and consumed Abu Dhabi island. Closing minutes, Terps clinging to small lead (any lead for the Terps is a small one). Don't look. Nothing says, "We're rich!" better than skyscrapers, palm trees, and fancy mosques in the desert. Unless you want to add in casinos, but then you'd have Vegas.